Our May 2015 selection from BlueInk Review, a service which reviews self-published books. This selection includes guides to finance and fighting cancer. In our effort to help facilitate the discovery of new titles that might interest overseas publishers for rights deals, we offer the occasional selection of “starred” reviews from BlueInk Review, a service which reviews self-published books. 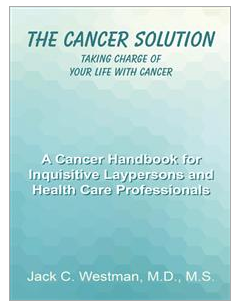 The Cancer Solution by Jack C. Westman, M.D., M.S. : Personal experience with his wife’s cancer ordeal led Dr. Westman to pen this terrifically clear-eyed and user-friendly guide explaining what stimulates cancer cells and how patients can prevent or control cancer’s growth and spread. The author discusses various forms of cancer, the pros and cons of conventional treatments, how readers can take charge of medical records and incorporate important exercise and dietary habits into their lives to prevent and battle cancer. Highly educational, yet written in an engaging, accessible style, this is a must-read book, even for those unaffected by a cancer diagnosis. Author’s current residence: Madison, WI. Read review. Banking on Confidence BY Dale K. Cline: A CPA, business owner and real estate investor, Cline brings the financial world to lay readers, detailing the basics of banking, accounting and the economy. Whether explaining economic jargon such as “quantitative easing,” or “crowding out,” the detailed workings of the real estate, oil and gold markets or the People’s Bank of China’s currency intervention operations, Cline makes economics enjoyable by cutting through the confusion of arcane terms and misinformation. His book stands apart from others for its wide-ranging content and its clear, compelling delivery. Author’s current residence: Hickory, N.C. Read review. Harbinger of Treason by Bayard West: Reminiscent of Elizabeth Moon’s saga (Once a Hero, et al. ), this page-turning fusion of military and adventure science fiction centers on Cassie Hague, whose father is an admiral with the Sol Alliance and whose mother is an ambassador with the Consortian Republic, entities with competing interests. Cassie finds herself caught in the middle when her budding love interest defects from Consortia to the Sol Alliance — with life-threatening consequences. Action-packed, fast-placed and intelligently plotted, the novel ends with a mind-blowing cliffhanger that will leave readers pulling their hair out waiting for the sequel. Author’s current residence: Escondido, CA. Read review. Jenna’s Book: Legend of the One and the Three by Angie Stair: In this charming take on familiar fantasy tropes, Jenna seems like a typical American wife and mother of three daughters — but she wields a rare form of magic. Jenna only realizes her special powers after a visit from an elfin creature who explains that his world is in grave danger, and that only Jenna and her daughters can save it. Stair’s careful characterization of Jenna and her daughters, along with her vivid narrative style, is sure to please longtime fantasy fans. Author’s current residence: Lawrence, MI. Read review. Walking the Stones of Time by Oswald Brown: Brown reveals his depth of knowledge of ancient history in this fantasy revolving around warriors who inhabit a prehistoric landscape marked by constant conflict and peril. Recalling George R.R. Martin’s most popular works, the story follows these warriors as they flee assassins and slave traders and travel through landscapes with evocative names such as the Valley of the Flies, the Water Gate and the Lost World. Driven more by human drama than magic, and including an underlying love story, Brown creates a world that doesn’t seem so fantastical after all. Author’s current residence: Ontario, Canada. Read review. Tug of War by Judith Somborac: Somborac’s compelling debut novel follows 15-year-old Miriana as WWII comes to her small Serbian town. The author skillfully presents the quieter challenges of life during war, alongside more dramatic developments. It’s just as fascinating to read about Miriana giving up her bedroom for her aunt, for example, as when German soldiers appear at the house while Miriana’s family harbors a partisan soldier in the cellar. Somborac expertly blends period details with lively characters, creating a novel that is a joy from start to finish. Author’s current residence: Ontario, Canada. Read review. A Vision of Wings: A Magical “Flight” of the Imagination by Sue Whitehead: This is the story of Sara, a caretaker at a wild bird hospital. Rescuing an injured female peregrine falcon she names Mistral, Sara is soon drawn into a deep, spiritual connection with the creature, one that eventually leads her on a mysterious and potentially deadly journey to help another bird in peril. Whitehead’s writing is precise and descriptive, infused with her understanding of bird behavior. Part mystery, part suspense, with a dash of romance – all anchored by the inexplicable psychic connections between humans and wild birds – this story will appeal to all who enjoy a well-written tale. Author’s current residence: Wales, United Kingdom. Read review. Hooked by Allen Wolf: Wolf turns conventions of contemporary romance on its stilettos by swapping out the typical sassy, fashion-obsessed female protagonist for a 24-year-old male, autistic computer programmer who also contends with synesthesia, a condition that makes colors have sounds for him. Shawn yearns for a soul mate, and when he meets Violet, a prostitute whom he believes is an actress, he feels he has found someone whose “colors sound just right to me.” A sweet, entertaining romantic comedy, Hooked touches on the power of faith and will appeal to readers who enjoy a blend of quirky characters, humor and drama. Note: The screenplay for Hooked has garnered numerous awards, including the Screenplay Award at the Las Vegas Film Festival. Author’s current residence: Houston, TX.< a href="http://www.blueinkreview.com/book-reviews/hooked/" target="_blank">Read review. Blake’s Story, Revenge and Forgiveness by J. Arthur Moore and Bryson B. Brodinski: Based on a plot suggested by his great-grandson, Moore’s young adult novel follows Blake Bradford, 11, after he learns that his father, a Confederate captain in the Civil War, has been shot and killed in the battle of Shiloh. As he seeks revenge, he is injured and eventually rescued by a teenaged Union soldier — only to be confronted with an emotionally wrenching revelation. Engrossing and memorable, this story is an excellent conversation-starter about the war’s ills, the drive for revenge and the profound power of friendship and forgiveness. Author’s current residence: Navron, Penn. Read review. I’m Tim Maude, and I’m a Soldier: A Military Biography of Lieutenant General Timothy J. Maude by Stephen E. Bower: General Timothy J. Maude’s life ended on Sept. 11, 2001, when he was a passenger on the hijacked jet that crashed into the Pentagon. Bower recounts the little-known life of this man — the highest ranking American soldier to lose his life in action — whose 35-year military career took him around the world and presented him with the challenge of overseeing “the human dimension of soldiering”: health care, family issues and more. Maude lived, and died, in an extraordinary era in U.S. military history, from Vietnam to 9/11. His story will interest not just military buffs but anyone curious about the times. Author’s current residence: Columbia, S.C. Read review. BlueInk Review was founded by Patti Thorn, former books editor of the Rocky Mountain News, and Patricia Moosbrugger, literary agent and subsidiary rights specialist. We offer serious, unbiased reviews of self-published books. Our reviews are penned by writers drawn from major mainstream publications, such as The New York Times and Washington Post, and editors of respected traditional publishing houses. If you are interested in receiving notices in your email inbox of other notable titles, please sign upfor our mailing list. We also invite you to visit our website: www.blueinkreview.com.